We’re excited to introduce a new PlayStation Network event: PLAY. PLAY is a brand-new annual program, where we’re bringing you four of the season’s hottest PlayStation Network action titles. With every purchase of a PLAY title in the PlayStation Store throughout the duration of the program, you’ll receive a separate piece of DLC for each game, plus a new theme with every pre-order. 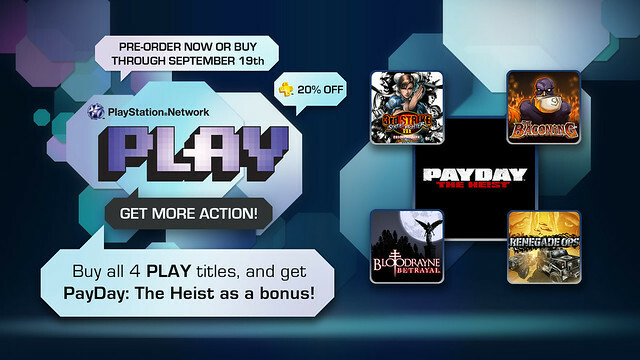 If these incentives aren’t enough, if you’re 18 years or older and purchase all four PLAY titles in the PlayStation Store, you’ll get a voucher code for PAYDAY: The Heist as a bonus gift. And, PlayStation Plus subscribers will get an automatic 20% off every purchase. Pre-orders will be available for all four PLAY titles starting next week on August 9 in the PlayStation Store. Remember, in order to qualify to receive PAYDAY: The Heist as a bonus gift, your purchases must be made by September 19, 2011. August 23: The PLAY program kicks off with Capcom’s highly-anticipated Street Fighter III Third Strike Online Edition, available to pre-order through August 18, 2011. This action-fighting title features 20 playable characters, HD graphics, more than 200 pieces of unlockable content, more than 100 trials and more than 100 challenges When Street Fighter III Third Strike Online Edition is purchased during the PLAY promotion, purchasers will be able to unlock GILL, the self-proclaimed god, without having to beat the game with every character, as day-one DLC. All pre-orders will also receive a Capcom-produced theme. Street Fighter III Third Strike Online Edition will be $14.99. August 30: Hothead Studios’ The Baconing will be available to pre-order through August 25, 2011. This action-RPG title is the third in the popular DeathSpank series. Attempt to defeat the Anti-Spank and his army of Cyborques, before they cast an evil shadow over Spanktopia. Discover exciting new worlds and battle hordes of enemies as you search to unlock the secret within the Fires of Bacon. When The Baconing is purchased during the PLAY promotion, purchasers will receive an additional co-op character, Roesha – One Bad Mutha. All pre-orders will also receive a static theme, exclusive to PLAY. The Baconing will be $14.99. September 6: Majesco Entertainment’s BloodRayne: Betrayal will be available to pre-order through September 1, 2011. This 2D side-scrolling platformer features 15 bloodthirsty levels where Rayne attempts to infiltrate a treacherous castle, take out a fiendish horde and stop an evil vampire massacre. When BloodRayne: Betrayal is purchased during the PLAY promotion, purchasers will receive a BloodRayne: Betrayal virtual item for their PlayStation Home avatar and an exclusive dynamic theme. In addition, all pre-orders will also receive a static theme exclusive to PLAY. BloodRayne: Betrayal will be $14.99. September 13: The SEGA title Renegade Ops will be available to pre-order through September 8, 2011.This top-down, driving shooter from SEGA features a huge variety of vehicles, guns and endless enemies. The game features Sandbox-style missions, so there are many different ways to play. When Renegade Ops is purchased through PLAY, purchasers will receive a Vehicle & Character Pack with two new vehicles and special weapons. All pre-orders will also receive a static theme, exclusive to PLAY. Renegade Ops will be $14.99. Bonus gift: PAYDAY: The Heist. This gritty, first-person shooter from Sony Online Entertainment lets players take on the role of a hardened career criminal executing intense, dynamic heists in constant pursuit of the next “big score.” A voucher code for PAYDAY: The Heist will be provided as a bonus gift to PSN users 18 years and older that purchased all four PLAY titles, for redemption when the game releases. The game can also be pre-ordered separately starting September 20, 2011, and all pre-orders will receive a static theme. PAYDAY: The Heist will be $19.99. What gamer doesn’t want to get more action? Get ready because PlayStation Network PLAY pre-orders start next Tuesday, August 9. So this is like Xbox Summer of Arcade? Renegade Ops looks REALLY cool. I hope there will be demos for each of these. So is this just like to pre-order PSN titles but you get a pre-order bonus? Like stores offer with the Blu-ray games? You get a special bonus if you pre-order any of these titles by the Thursday before their release. The pre-order bonus will be a sweet PS3 Statis Theme for each game. You’ll also get a bonus gift in the form of some type of DLC or Home virtual item once or slightly after the game releases. The pre-order feature is new to the Store so we wanted to give a bonus to those that do so for this event. Everything is $15. Even with a discount I can’t get myself to support this pricetag. I will continue to resist the price even if I’m the only one who does. That aside this is a neat idea for PSN. Glad PSN finally has this but I’m not sure you’re using it to promote the right titles. These PSN games need to be the best of the best. People won’t buy into this promotion if these games aren’t good enough. Tenth! What is this game? @#6 – This is very similar to a promotion that Microsoft runs every summer, which is what the first post was comparing it too. I definitely like this idea, though I’m not personally interested in the four titles that have been picked so I’ll probably pass & pick up PayDay when it comes out (as that game looks fantastic). Sadly nothing there I am interested in besides Payday. This seems like a good idea but im kinda only interested in Street Fighter. When will we hear a release date for Papo & Yo and Journey? Good news is, looks like you’re a Plus subscriber, so you can get 20% off SF3, AND get a free piece of DLC when it releases. Plus you get an extra PS3 theme when you pre-order. but remember you’d have to purchase it before the event is over, so do so before 9/19/2011. So you want people to pay $60 to get a $20 game free? I’ll do what i always do for the most part and wait the year or so when the games go on sale. Now theres the real deal. I think discounted games are better for the gamers, that way we buy the games that we only sort-of wanted when they go on sale. This is one way to promote new games. That is really cool. Can’t see myself getting all of them but still a nice little thing to do. A bit too expensive and I’m not interested in all of the games, so I’ll pass this year. Hopefully I’ll enjoy next year’s line-up more. If one of the games interests you, use that Plus subscription and you’ll get 20% off and get the bonus gifts. So no need to buy all 4 to get the benefits of the event. Is this a yearly thing or a monthly thing? How often are offers like this going to come up? I am interested in Journey, and also Sideway. Hope we had these games to choose from. Was BloodRayne: Betrayal delayed by a week? Just last month it was announced that it was going to be released on August 30th. So, um…, WHAT IS IT AGAIN!? I still don’t get it!? There needs to be a wider selection of games. As it stands, I’ll probably buy PAYDAY: The Heist at full price. Bloodrayne looks sorta interesting, the rest do nothing for me. Hey, we’ve got Pluses…! Woohoo!. When did that happen? 2 days ago =) Thanks again go to the web team for making it happen. not an easy task! Actually sounds pretty cool. I hope more titles go up for pre-order in the future. I got my eye on 3 out of the 4 anyway. Great idea, but please, PLEASE limit this program to PSN EXCLUSIVE games in the future! Yeah seems pretty interesting but might be a little pricey for some of the games that probably arent worth it. During the last leg of the beta for PSRewards they stated that it just wasn’t ready for prime time and that they were going to pull back and rework it before releasing it. No more information was given, and the way that the programme was functioning I doubt it will be any time soon that we hear anything about it. It was kind of broken. The inclusion of Street Fighter means I won’t even consider this promotion. No appeal to me. I may just buy Payday if its is 20% off for Plus though. @osowanted Yeah, what did happen to PlayStation Rewards? Rewards sounded like it was a good idea, even though I think it really wasn’t developed as well as it could have been. Hey Sid, Jeff and co… how about having some kind of reward (or at least promotion) for installing the Facebook PSN application, and linking your PS3 to your Facebook account. During the Uncharted beta I checked out the Facebook integration, and found that out of my 400 Facebook friends – a grand total of ONE friend had linked up his account and was using Facebook integration. It’s not really surprising though… in a world of 500,000,000 Facebook users, and 77,000,000 PSN users, how come only 27,981 are using the Facebook app? $60 for 5 games is not a bad deal and even better for Plus subscribers. Unfortunately I don’t like Street Fighter just like Rockso78, otherwise I would totally go for this. It’s clearly a knock off of Summer of Arcade, but I’m glad that we have similar. I also love how us Plus members get automatic 20% off of the games. I also love how we just get Gill in SFIII. Sounds good to me. Great deal for PS+ members. Basically $9.60 for each game including PAYDAY. I love it. Don’t see the need for Street Fighter 3 since I have 4, but the other games look pretty awesome. Street Fighter 3 is definitely more technical than SF4, but it’s plenty awesome and great see get a second revival. Give it a shot if you’re a SF fan! It’s a great gesture, I just wish you guys had better games up there like Journey. The BloodRayne game looks interesting, but it’s worry some when I’ve never heard of it until today. So it’s not like an annual subscription sort of deal? how much is this program going to cost for an annual subscription? This is not a subscription based program; it’s an annual event that we’ll be doing to let gamers get more from their game (ie: extra DLC, PS3 themes, Home items) by purchasing them as part of this program. How bout you guys quite wasting your time on these programs and address the Cross Game Chat issue that has been in the number one spot since your Blog Share site began. That is what your customer want !!!! I would get Street Fighter and DeathSpank but honestly the other two are just… BloodRayne hasn’t been a good series since ever and Sega putting out a vehicle combat game when I could wait for Twisted Metal? Need more reason to grab those two or it just ain’t happening. Asking us to spend 60$ for promotion of a 20$ game? I dont think so. How about adding Role-Playing, Japanese Role-Playing, Adventure, Shooting, Puzzle, and every genre to that feature listing? That’d be nice to do that!!! Please add them, thanx. Guys its August not April.